The Alliance for Physics Excellence (APEX) is a five-year program, funded by the National Science Foundation, designed to enhance physics teaching in Alabama's high schools. The APEX program aims to integrate the latest teaching practices into secondary physics classrooms via pre-service and in-service teacher education, ultimately impacting a quarter of the physics teachers in the state’s school systems and more than 40,000 students. 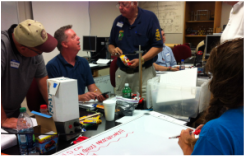 The goal of APEX is to serve as a model for other large-scale national physics teacher initiatives. Alabama A&M University is the lead institution in the APEX program. The University of Alabama is a partner institution. Other APEX partners include J. F. Drake State Technical College, the American Association of Physics Teachers, and the Huntsville City School System. Additional supporting partners are comprised of 11 Alabama Math, Science, and Technology Initiative (AMSTI) regional in-service centers, Madison County schools, Scottsboro City Schools, Madison City schools, and the Alabama State Department of Education. The University of Alabama’s role in APEX includes providing leadership in conducting a state-wide research program on effective teaching and learning practices of in-service physics teachers in the state of Alabama. An additional role involves providing a model physics teacher preparation program and administering scholarships/stipends ($16,000 per year) for the preparation of pre-service education physics students. APEX at UA will collaborate with other programs within the university including the Department of Physics and Astronomy and the Department of Curriculum and Instruction on teacher preparation. Other collaboration at UA involves the PhysTEC grant (3 year, $300,000) recently awarded by the American Physical Society, and several Physical Science for the 21st Century (PS-21) grants ($40,000/yr) awarded by the Alabama Commission on Higher Education. Additional partners at the University of Alabama include the Department of Curriculum and Instruction’s SciTeach pre-service teacher preparation program and the Office of Research in Teaching in the Disciplines (ORTD).